Summary: After her mother gets married for the fifth time, seventeen year-old Dani thinks she will be spending the six weeks her mother is on her honeymoon by herself. But her mother springs a surprise on her: instead Dani will be spending the time with Sam, the uncle she never knew about. Although she could be angry about her mother keeping secrets from her, Dani opts for excitement over getting to know a new family member. Sam and Dani are two peas in a pod, enjoying an easy camaraderie right from the start. While on her vacation with Sam, Dani learns to ride a horse and starts a relationship with a local cowboy-type. Living in a trailer with Sam doesn’t offer a lot of space though, which is why Dani ends up stumbling over more secrets that will change her life forever. 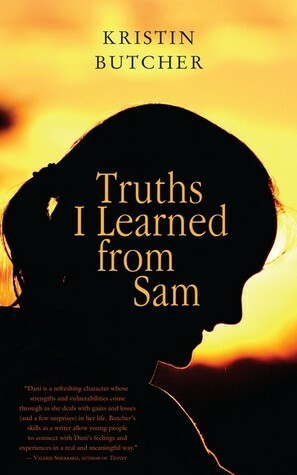 Review: Truths I Learned from Sam by Kristin Butcher is a tricky read. Characters Dani and Sam are easy to love, the setting of the fictional town of Watts River is idyllic and the theme of the lengths we will go to for family is thought-provoking. But Dani’s story seems to be a case of accepting the reality with which we are presented. At first Dani believes her mother is an only child. Then she learns she has an uncle who wants to see her and it doesn’t occur to her to question what conflict between him and his grandparents would be strong enough to keep them apart. As the story progresses, each time Dani learns something new that reveals a higher level of secrets and lies, she just seems to absorb it. Without question, and without anger. While I loved Dani as a character, I question whether what appeared to be the responses of an extremely well-adjusted teenager are actually signs of someone who has problems expressing her emotions. Will the anger over the deception simply come later? I give kudos to Butcher though because while I did have to suspend my disbelief for the last part of the story, I still wanted to know what happens next. And this morning I found out from Dundurn Press the sequel, In Search of Sam is coming out in May. I have no idea where Butcher is going to take Dani and Sam’s story, but I know I want to find out.